Biomedical engineer Melissa Knothe Tate at the University of New South Wales (UNSW) in Australia is using previously proprietary semiconductor technology to zoom through organs of the human body, down to the level of a single cell. UNSW Professor Melissa Knothe Tate, the Paul Trainor Chair of Biomedical Engineering, is leading the project, which is using semiconductor technology to explore osteoporosis and osteoarthritis. Using Google algorithms, Tate — an engineer and expert in cell biology and regenerative medicine – is able to zoom in and out from the scale of the whole joint down to the cellular level “just as you would with Google Maps,” reducing to “a matter of weeks analyses that once took 25 years to complete”. Tate is the first to use the system in humans. She has forged a pioneering partnership with the Cleveland Clinic, Brown and Stanford Universities, Zeiss, and Google to help crunch terabytes of data gathered from human hip studies. Tate presented several papers on her research into the human hip and osteoarthritis at the peer-reviewed Orthopedic Research Society meeting in Las Vegas. Tate has already demonstrated a link between molecular transport through blood, muscle and bone, and disease status in osteoarthritic guinea pigs. Understanding the molecular signaling and traffic between tissues could unlock a range of treatments, including physical therapies and preventative exercise routines, Tate said. 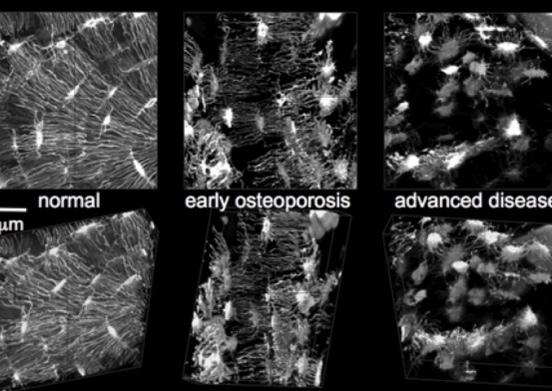 Critical to this work has been the development of microscopy that allows seamless imaging of organs and tissues across length scales – centimeters at the whole-joint level down to nanometer-sized molecules – as well as the capacity to sift and analyze huge sets of data.